Because our logs are kiln dried first to remove moisture and then insulated with polystyrene, fiberglass or cellulose, the R-Value is much higher than traditional full log construction. This translates into your future home’s heating and cooling costs being significantly lower each year, while maintenance and the likelihood of possible future structural issues are also greatly reduced. Below are several methods of construction we offer to meet your specific requirements when it comes to quality and price point. 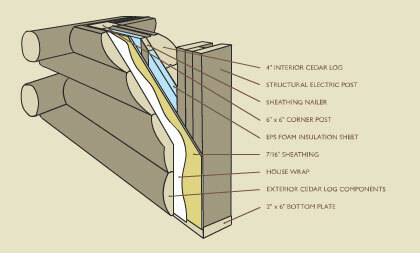 Instead of simple walls made from whole logs, ours is an entire insulated log wall system. It combines thermal mass with thermal breaks. The result is greater energy efficiency when it comes to both heating and cooling. This is why we’re the only ones to guarantee our work with a 50-year warranty against air and water infiltration when you choose the System 3000™. By using large insulated panels in a variety of wall and roof thicknesses, your home can be constructed more quickly. With fewer seams, the home itself will be so energy efficient and airtight we recommend downsizing your furnace and air conditioner, along with installing a fresh air exchange. 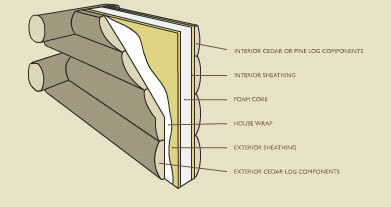 Most familiar to builders, the Cedar Classic is created using conventional framing and insulation with a log component exterior. The logs are kiln dried, so there aren’t any settling or chinking issues to worry about afterward. 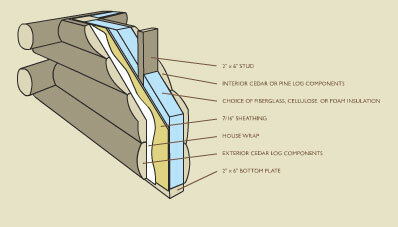 And it can be applied to an existing structure as well, making your home or cottage look like a brand new log home. 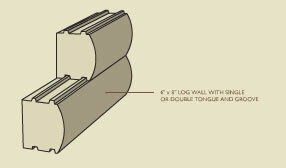 The most cost effective way to build a log home, materially speaking. Made from solid, kiln dried, tongue and groove cedar logs that are stacked on top of one another.